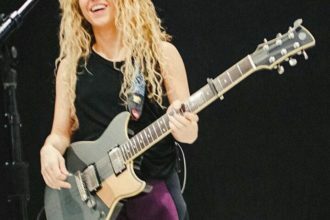 Colombian pop star Shakira is being sued for $100m (£62.4m) by a former boyfriend who acted as her business manager for six years. Antonio de la Rua claims he was the “principal architect” of a business plan that turned the singer into a global superstar. He is seeking to “recover his share of past and future partnership profits,” according to papers filed in New York. Her legal case, filed in the Bahamas in October, accuses him of paying himself an unauthorised bonus and using funds from their business partnership to pay personal expenses. Mr De la Rua denies the allegations. His legal papers, however, provide a rare insight into the intricacies of sustaining a global pop career. He explains how the couple met in 2000, shortly after he had managed his father Fernando’s successful campaign to become president of Argentina. As they became romantically involved, he frequently joined her on her first world tour – The Tour Of The Mongoose. He describes how, as it came to a close, the star was “shocked” to learn the tour had “actually lost money”. The news caused the performer “extreme emotional distress and interfered with her ability to sleep and perform”. She sacked her manager, and asked Mr De la Rua to take over her business affairs. They agreed he would be entitled to a share of the profits from her music and business ventures “in exchange for the contribution of his business and marketing skills, knowledge and expertise”. But his court papers acknowledge that the partnership, which began in 2004, was based only on an “oral agreement”. Mr De la Rua goes on to describe how he brokered a $300m deal with concert promoters Live Nation and a “lucrative” deal for a range of perfumes. He was also instrumental in persuading a reluctant Shakira to record the song Hips Don’t Lie in order to reverse flagging sales of her Oral Fixation Vol. 2 album. The song went on to top the charts in more than 25 countries. The court papers describe a similar situation in 2009, when the first single from Shakira’s She Wolf album “bombed”. He claims to have brokered a deal for Shakira to record the official World Cup song Waka Waka, the success of which ensured a profitable world tour which “saved the relationship” with Live Nation.